Duncan - Great 4A Yo-Yo for Beginner or Pro! Look! Up in the sky! It's a bird! It's a Plane! It's... THE DUNCAN SKYHAWK! Okay okay, maybe it can't do the river moving or steel bending thing, but I definitely saw it up in the sky! The SkyHawk is one of the most anticipated offstring throws to come out this year, and it's finally here at YoYoExpert! 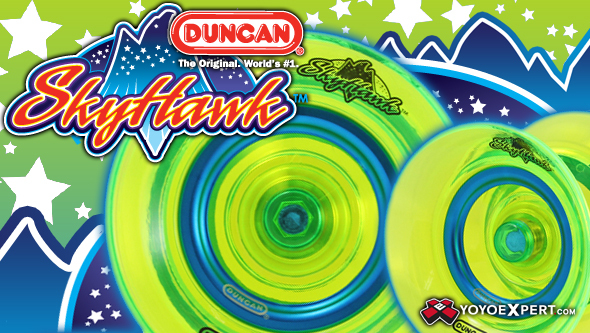 Duncan created the SkyHawk to be a top performing 4A monster for everyone from beginners to professionals. It has a slightly stepped wide v-shape profile that gives you a huge catch zone and great speed and maneuverability through combos. The Skyhawk is molded from really durable plastic and the weight distribution is improved by metal weight rings that amp up spin time and stability. But what's the coolest feature you ask? The SkyHawk comes with a unique new spacer system so you can switch between a Size C or Size A bearing - Just flip the spacers and get ready for a whole new offstring experience!